This History of Ireland pendant is crafted in 14K gold and features a double sided design. The History of Ireland jewelry collection is crafted in Ireland by Solvar Jewelry and is hallmarked by the Irish Assay Office at Dublin Castle. Each symbol represents a different era in Ireland’s history and is explained in the included History of Ireland booklet. This History of Ireland necklace is retired and is limited to stock on hand. This gold History of Ireland necklace is a double sided doughnut shaped pendant that measures 3/4" wide x 1" tall, including the jump ring and the chain bail. 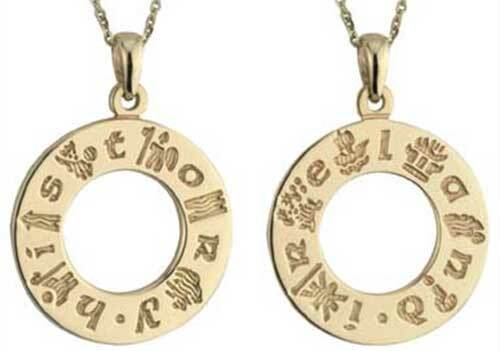 The engraved design features an icon separated by a letter that spells history on one side and Ireland on the reverse side; six of the twelve History of Ireland icons are present on each side of the gold pendant. The History of Ireland necklace includes an 18" long yellow gold chain and it is gift boxed with a legend booklet that explains the symbolism of the icons. The gold History of Ireland ring is a unisex band that is suitable for both women and men. History of Ireland bracelet features 14K gold links in a design that is sized for a woman's wrist. History of Ireland Celtic cross charm is cast in 14K gold and it features icons that represent different eras in Irish history. History of Ireland pendant is cast in 14K gold in the shape of a disk.